I’m a big fan of the LEGO Ideas theme. Of all the themes, it’s definitely my favourite. It has a fantastic amount of variety, and also some of the best display sets I own. 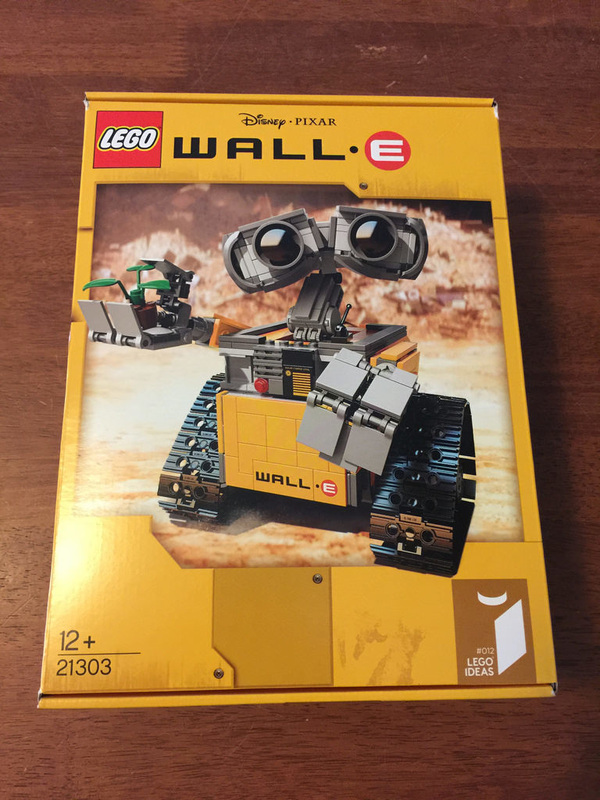 Wall-E is now one of my new favourites! Read on to find out why. 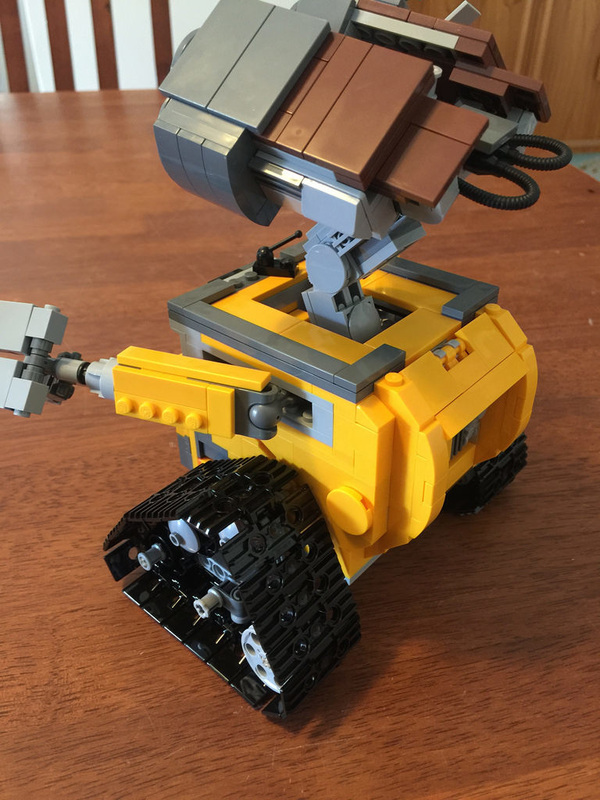 Wall-E was Pixar’s standout success story in 2008, where it was loved by fans of all ages, all over the world. A beautiful animation about an adorable little robot. 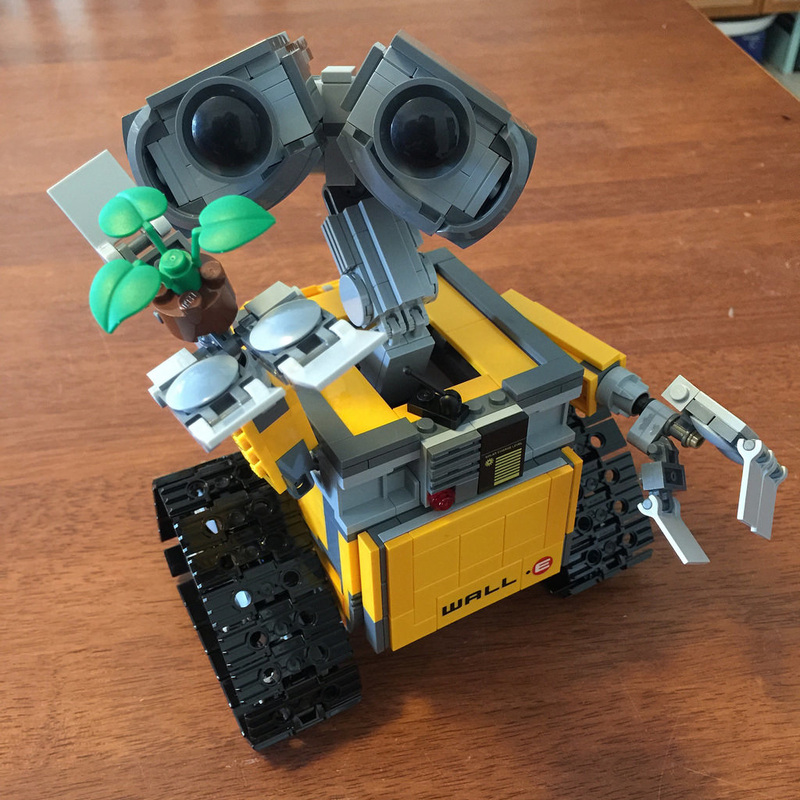 Being able to construct a Wall-E of my own, complete with it’s own touch of adorableness was a must. This set is beautifully put together, with som extremely clever build techniques, a nice variety of parts, and not a sticker in sight! The creator, Angus Maclane, worked on the film itself, so had intimate knowledge of the character. 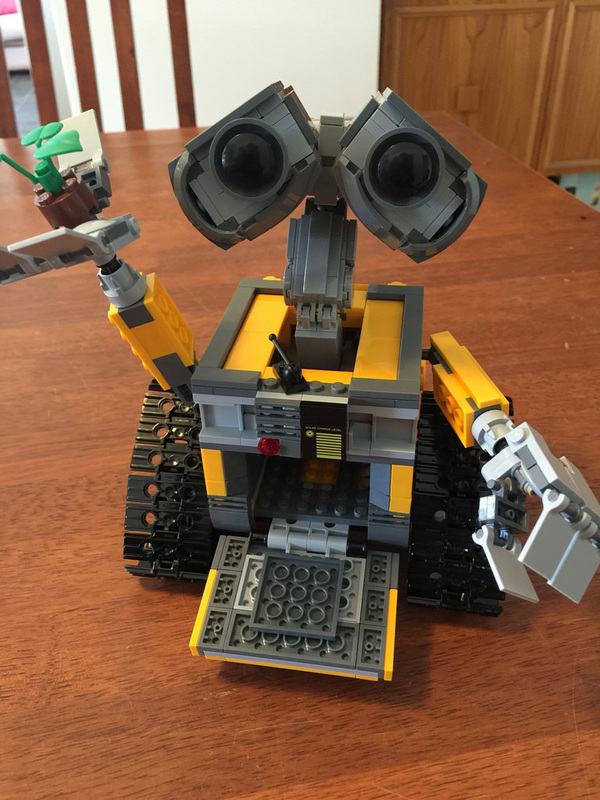 He’s also a brilliant LEGO builder, so hand in hand, these two skill sets were bound to result in awesomeness. The original project has seen some changes that are quite noticeable, as they are mostly around the eyes. 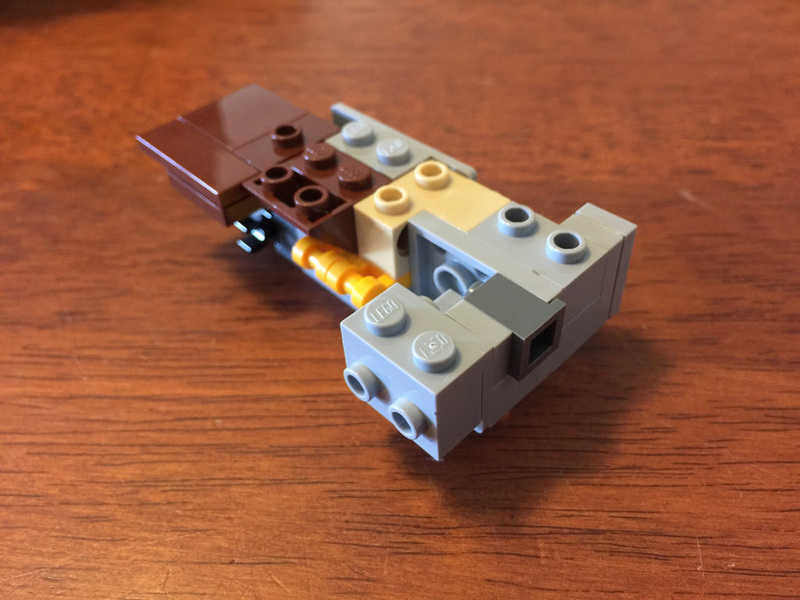 Admittedly, these changes were in a modified submission to LEGO Ideas, so between that and the model that hit shelves, there’s not too much difference. There’s a lot more expression and personality seen in them, and there’s the inclusion of the plant. Along with some minor differences in the tracks and front, that’s really it. I’m glad for the differences though, as it makes him appear much more adorable! 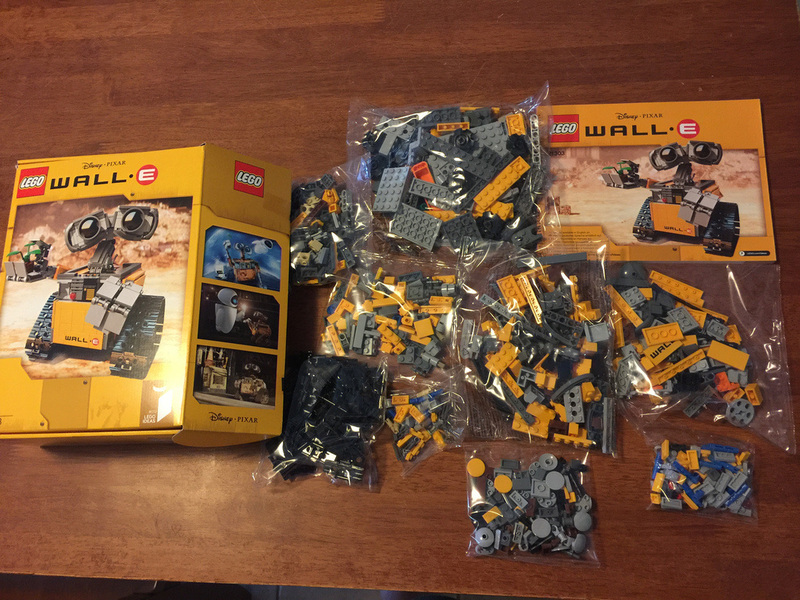 Out of the box you’ll end up with 9 un-numbered bags of parts, and a very nice instruction booklet. Nothing new when it comes to moulds in this set, but there are loads of parts on a new colour – Bright Light Orange. It’s certainly bright! There are some nice printed tiles – great to see these over dreaded sticker sheet. There are the nice new tracks that were released earlier in 2015, and a plant as well. All in all, pretty good inclusions. This set has a fair bit of movement in it. Obviously there’s the caterpillar tracks, which roll around quite nicely. The arms move forward and back, with some friction caused by a rubberised axle connector, and the hands can open up and rotate, and have the ability to hold the plant as well. The front opens up, the neck moves, and the eyes have that characteristic pivot in the centre. It’s probably not a set for playing as much as display, but there are so many different ways to position him, it’s a really fun set to get your hands on. The build experience is nothing short of fantastic. 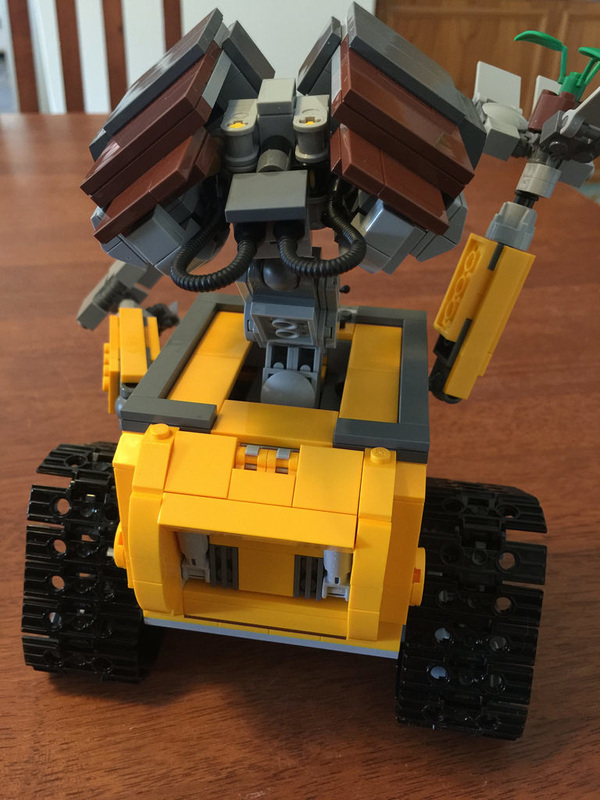 It starts off with some pretty basic techniques – you’re building the boxy part of him, so it’s bricks on bricks. It’s when the neck attachment gets added is when the techniques get interesting. 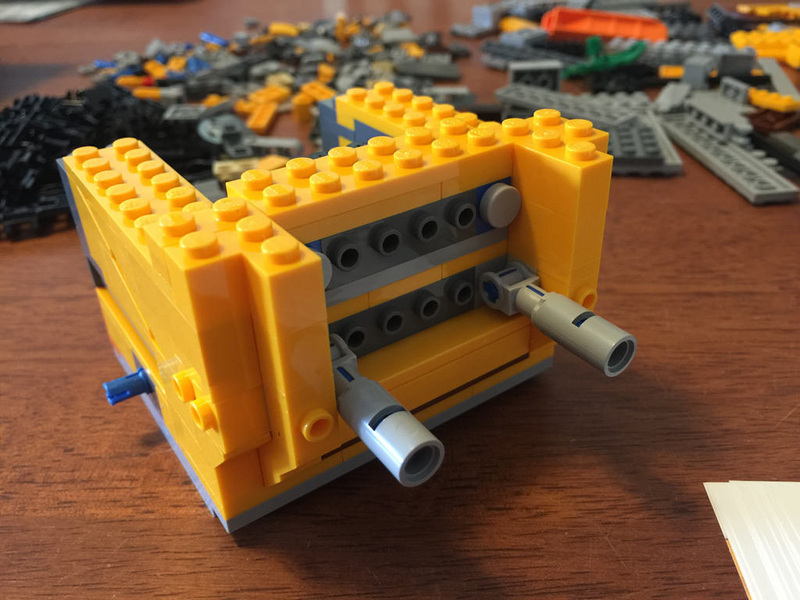 The arm sockets are set in place, and then covered up with some tiles.The base is held in place with double click hinges, followed by the back being covered up with some basic SNOT techniques, followed by the front door. That’s the body done. Next up, the tracks are built, with four wheels giving them the shape they need. These tracks work really well on carpet, but not great on smooth surfaces like my build table! The last section of the neck is added on (I ordered mine at the right time to get the second version of the neck attachment). The best part is the eyes. There’s so much SNOT in here, it’s not funny! It’s incredible that someone was this clever to think this through. I was amazed as I was building them. 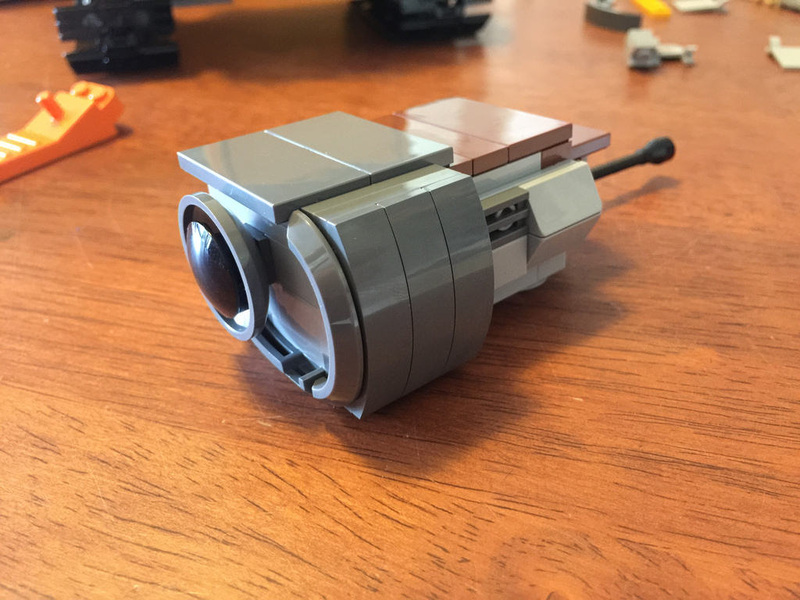 Parts are at all sorts of different angles, and the final product is a beautiful example of LEGO ingenuity at it’s best. The set is worth building for this experience alone. The arms are then put together, and while simple, they look really effective, and can sort of grab on to the plant. It’s currently sitting on my shelf with the plant stuck to the stud inside his hand. This set is still available, so do yourself a favour and go and get it! It’s decently priced, has some nice new colours, and is a must for your collection. Second hand markets will see you spending a little more on a BNIB set, but just go straight to the source and save a bit of money while you can. This set is sure to skyrocket when it retires. 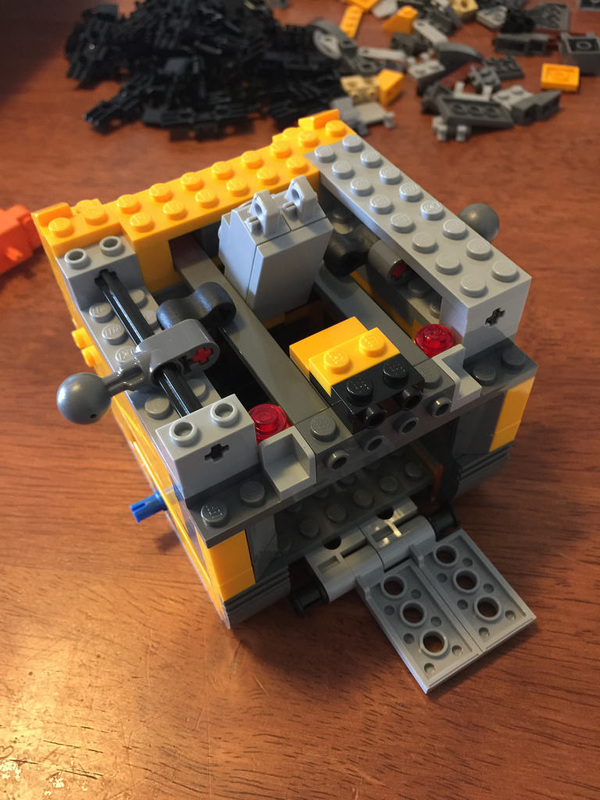 Next week I’m staying with the LEGO Ideas theme and moving on to 21302: The Big Bang Theory. After that, I’ll be heading back into the bulk lot of sets to see what else I uncovered. Do you have 21303? What did you think about it? Let me know in the comments! To be honest, this is my favourite Ideas set of all the sets in this theme. This model is so well designed and executed in Lego, making it instantly recognisable and because it looks so cute also very likeable! It instantly draws the eye, doesn’t it? I’ve got a few friends that have admired that one for a while!